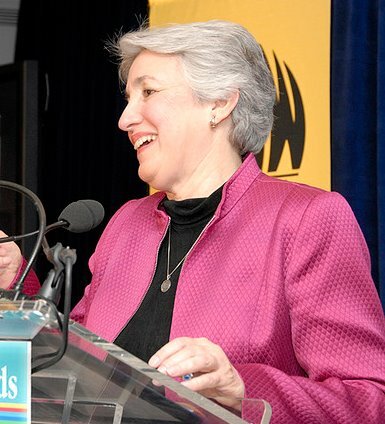 One of the most inspirational women I’ve ever met is Eleanor Smeal. She has arguably done more to advance the status of women in the United States than any other single individual in the last 50 years. The former president of the National Organization for Women and the founder of The Feminist Majority Smeal has never received nearly as much credit as she deserves. Outside of feminist circles, Smeal does not have the name recognition, the iconic status of some other more famous leaders of second wave feminism—e.g., Gloria Steinem, Betty Friedan. The Nation recently had a cover story, “That Seventies Show” on the recent spate of books on the 1970’s with 9 photos of those they considered the major newsmakers of the 70’s; only one (!!) was a woman, Gloria Steinem . The article doesn’t even mention feminism—the really big story of the 70’s. I have tremendous respect for Gloria Steinem. Both she and Friedan were talented media strategists who had much to do with feminist ideas breaking into the mainstream media and changing hearts and minds. But the major legislative victories of the 60’s and 70’s would not have happened without the organizational skills and the brilliant strategic thinking of women like Eleanor Smeal. The generation of ideas and consciousness are central to guiding a movement. More than money and resources, more than marching millions, first must come an understanding of what’s wrong—better yet, a sense of outrage—and ideas for creating change. Then come resources: people skills, in-kind services, materials, faxes, postage, phones and now computers—and the money to make it happen. Under-funded work is too frequently falsely valued as “noble work,” and fundraising thought of as “dirty.” Let’s face it: under-funded work can’t get the job done. I’ve been doing archival research for a book Feminism in Philly: The Glory Years, 1967-1982 and it's become clear what a major impact Smeal had on NOW in particular and the feminist movement more generally. What emerges is how NOW under her leadership began to take on race/class issues and develop a much more inclusive form of feminism. President Smeal concluded with an expression of NOW's unity with other organizations backing Labor Law Reform stating, "The struggle for women's rights is really a struggle for human rights and dignity, which these reforms will help to insure." "The women's movement and labor also have common opponents," she said. "While the right wing is busily defeating the Equal Rights Amendment, it has also been busy defeating common site picketing and promoting 'right to work' laws. It is no coincidence that of the fifteen states against the ERA, the bulk of them are also 'right to work' states." 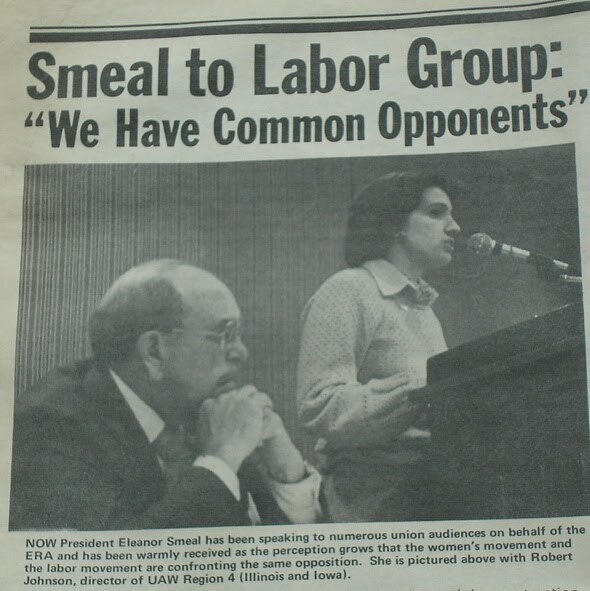 Sadly, the feminist movement under Smeal’s leadership lost the battle for the ERA, but the involvement in that struggle taught a whole generation of feminists a range of political skills which led to the entrance of more and more women into political life in the 80’s and 90’s. Smeal coined the term gender gap and was the first to note, track, and analyze the divergent political preferences of men and women. March 8th is the 100th Anniversary of International Women's Day. To commemorate this historic event, join with the Feminist Majority Foundation in Standing with Our Sisters Worldwide Week of Action from March 8 to 15. Help us deliver thousands of emails to the Senate to stop the House's inhumane budget cuts for international family planning and reproductive health. The U.S. must change its foreign policies that deny women in poverty stricken countries real choice. We are determined to bring into focus the 500,000 women and girls needlessly dying from pregnancy related illnesses every year -- one woman every minute -- because of inadequate reproductive funding and contraceptive supplies. Over 70,000 women are dying yearly from botched, unsafe, and illegal abortions alone. The House recently passed budget cuts that drastically reduce (by 43% from 2010) all international family planning aid and forbids not only all funding for Planned Parenthood, but also funding of the United Nations Population Fund, the agency promotes reproductive healthcare and gender equality to reduce maternal deaths in some 150 nations, especially in Africa and Southeast Asia. Tell your Senators to reject these inhumane policies and restore family planning domestic and international funding and funding for PPFA and UNFPA. No U.S. funds are being used for abortions - this is just an excuse. This is a horrific attack on poor women. It must stop. The international movement for women’s rights is the major struggle of the 21st century and Eleanor Smeal is in the forefront of that struggle. You've helped me to view Smeal in a new way, Karen. Her alliance with labor wasn't something I'd known about, and that more inclusive consciousness (to use her word!) makes her the more admirable. Apart from the content of her work, though, is the dedication to spend decade after decade moving toward an often-distant goal. For that, I thank her...and you! I didn't know about her alliance with labor until I started doing research for book on feminism in Philly. The more I learn, the more I realize that her organizational talent was key to feminist victories. For me, feminism's natural affiliation with the labor movement is rooted in stories from my great aunts and grandmothers. During and after the depression, they labored in the textile mills of Piedmont North Carolina when their men were sick, unemployed, or absent (due to travel to seek employment). The mills hired seamstresses, worked them miserably and paid them little. Labor struggled to champion woman and child labor rights. During this tough economic time, I sometimes wonder what it would take to bring jobs back to America. We are in danger of moving backward on women's rights, both politically and under pressure of economics. So often now, it is the woman who is employable in the family, but corporate policies push to work her to death and pay her less; the women have no choice if they hope to keep their families fed. Nance, You are right that "We are in danger of moving backward on women's rights." We need a feminist/labor alliance more than ever!! Ellie Smeal was the President of my local (Mt. Lebanon, PA) NOW chapter around 1970. I was in high school and the youngest member of her group. Ellie gave me my first job, cleaning up a NOW operated child care center (very revolutionary!) and took me to lunch with Gloria Steinem. Wow! Ellie's NOW meetings were very serious, humorless affairs, totally based on passing feminist issue legislation in Pennsylvania. She knew, unlike most NOW members, that passing laws was the most effective way of changing culture. Although I didn't follow her path in law, and I doubt that she has strong memories of me, she has served as a lifelong inspiration to me. I like to think that I've passed her living legacy along to my daughter and son. This women worked a lot for the rights of the women, specially those women who work in different kinds of fields. She identify their problems then highlight in bigger platform to get the solutions of these issues. However, I'm looking assignment geek writing services and now she has great respect and still work to empower the women. The Great Spring Awakening has been put on hold. The gardening season has begun!